Her iki bölüm seminer videoları yukardadır. 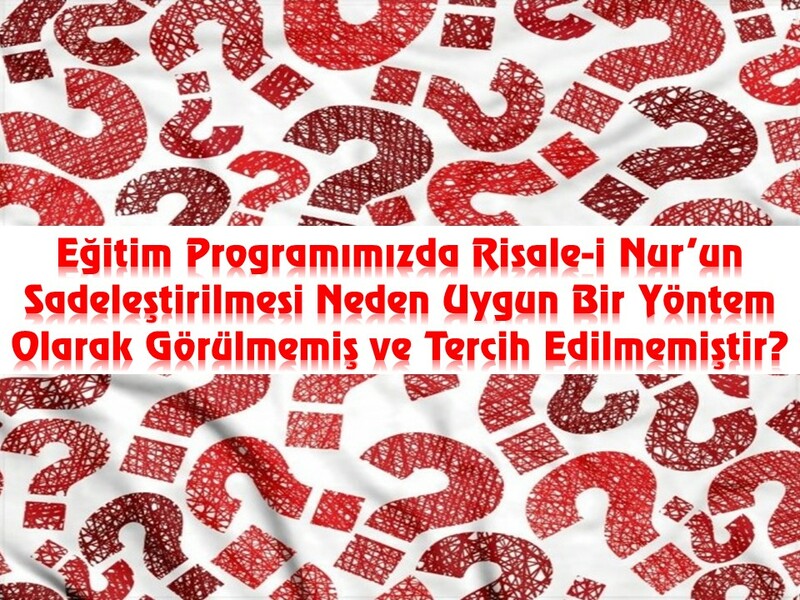 2- Eğitim Programımızda Risale-i Nur’un Sadeleştirilmesi Neden Uygun Bir Yöntem Olarak Görülmemiş ve Tercih Edilmemiştir. Keşif Yolculukları Risale-i Nur Eğitim Programı’mızın ek bölümleri içine alınan ve “Risale-i Nur’u İnsanlığa Mal Etme Çabası: İzah Çalışmaları” isimli kitapla aynı içeriğe sahip olan bölümlerin, eğitim programının bir parçası olarak görsel destekli seminerlerle sunulması planlanmıştır. Seminer sunumlarının gerçekleşmesi beklenmeden yayına almayı uygun gördüğümüz aynı isimli görsel/interaktif kitabın içeriği, yaklaşık 7 saatlik bir sunumla 3-4 seminer ile sunulacak ve inşallah yukarıda adresi verilen oynatma listesine videoları eklenecektir. Tags: A Journey of Discovery for an Extraordinary Treasure: Risale-i Nur (The Treatise of Light) Training Program, bediüzzaman said nursi, ediz sözüer, izahlı risale-i nur dersleri, Journeys of Discovery, keşif yolculukları, Manevi Medresetüzzehra, medresetüzzehra, risale-i nur, Risale-i Nur (The Treatise of Light) Training Program, Risale-i nur dersleri, risale-i nur eğitim programı, Risale-i nur izah, Risale-i Nur izah metinleri, risale-i nur izahı, risale-i nur sohbetleri, SPIRITUAL MEDRESETÜZZEHRA, The Educational Approach of Medresettüzzehra, Visual Interactive Book | Permalink. Tags: bediüzzaman said nursi, ediz sözüer, izahlı risale-i nur dersleri, keşif yolculukları, Medresetüzzehra Eğitim Yaklaşımı, READER COMMENTS, risale-i nur eğitim programı, Risale-i Nur izah metinleri, risale-i nur sohbetleri, İNANILMAZ VE HARİKA OKUYUCU YORUMLARI | Permalink. We talk about something new and very different: Mentioning Allah, even mentioning Him with justifications; and building a science approach and philosophy of science that will be approved and be presented to humanity totally differ from each other and have big cliffs between. 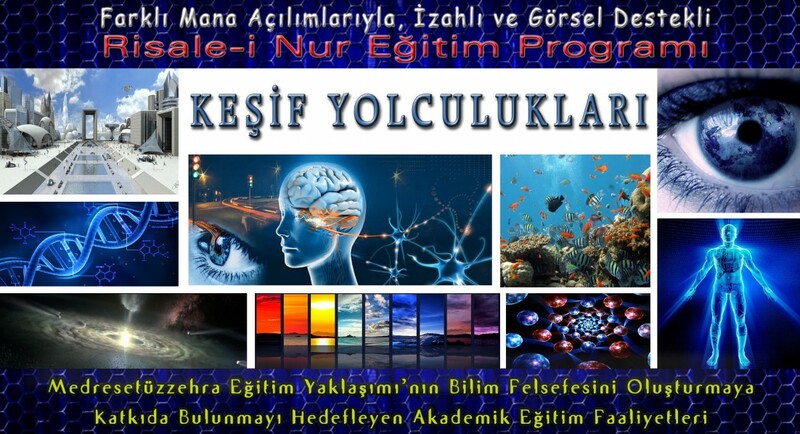 “Medresetüzzehra Education Approach” introduced by Bediuzzaman Said Nursi as an innovative education project at the beginning of the era is the special name of “instructing rational and religious sciences together, reconciliation and merging of them” It is not restricted to their being instructed together only. Bediüzzaman Said Nursi, at the beginning of last century, presented “Medresetüzzehra Education Approach”, as the special name of a project of innovational educational program, teaching of rational and religious sciences together, their reconciliation and integration. Our program aims to provide serious analysis and studies, as a philosophical basis, in terms of introduction to the Scientific World of such an educational approach which accepts the existence of a Creator, by developing scientific models, and interpretations which can prove to be alternatives to scientific approaches to the existence of the Creator, by developing alternative scientific approaches that can be accepted and by establishing the philosophy of science and curriculum of “Medresetüzzehra Education Approach”. 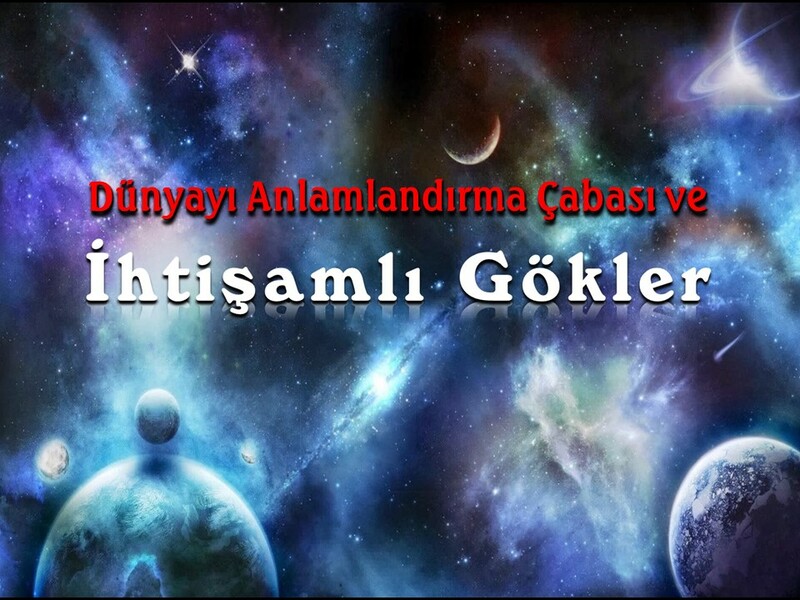 We have presentations which have been presented in two languages in international congresses (Turkish orally, English written) and published in academic literature, which search for the proofs of the acceptance of a creator’s existence and makes its deductions in this direction; which reveal the value of scientific approaches and studies for humanity, and make deductions on the worth of scientific knowledge and interpretations in this direction. We also have some analyses on how a scientific approach will be presented to the scientific world. For us, the most prior and important subject is to occupy oneself for the sake of Medresetuzzehra and Quran civilization. Yes, making significant analyses about how to present such an education approach to the scientific world and producing intellectual infrastructure is an occupation above all. Yet, unfortunately, we deeply express our sadness witnessing that in the two Creation congresses, the number of presentations dealing with this subject are only a couple although around 90-100 years passed over the publishing of the Works. We need this so much. Tags: A Journey of Discovery for an Extraordinary Treasure: Risale-i Nur (The Treatise of Light) Training Program, ateizm, bediüzzaman said nursi, bilim din felsefe ilişkisi, canlılığın oluşumu, Coincidence and Material Causes, ediz sözüer, Explanatory Texts for Risale-i Nur (The Treatise of Light), Intelligent Design, International Congress of Creation, laws of nature, Medresetüzzehra Eğitim Yaklaşımı, Nature, Philosophy of Science, risale-i nur, Risale-i Nur (Treatise of Light) Training Program, Risale-i nur dersleri, Risale-i Nur Explanatory Works, risale-i nur eğitim programı, Risale-i nur izah, Tabiattaki Maddî Sebepler, Uluslararası Yaratılış Kongresi, yaratıcı, yaratılış, yaratılış kongresi | Permalink. Here, we desperately need to build a philosophy of science which accepts the existence of a creator and makes its deductions in this direction, which has a solid logic construct about all these, which confronts humanity with alternative models, and puts across itself. Otherwise, how and in what way will the dignified Civilization of Islam/ Quran which is heralded and is the last hope of humanity be built! No, this is not easy and simple that much. We leave our detailed analyses on how this is going to and should be done, to our other examinations. Looked from this side, we see many and great tasks required to be done and developed. Risale-i Nur can only be a basis and source/guide book. In the face of the developing world, science and technology; we need new, developed explanation and presentation styles which will adress humanity and satisfy, which will have strong and sufficient logic constructs to be applauded on science platforms. At the moment, we want to mention the contributions of our “Discovery Voyages Risale-i Nur Program” to philosophy of science and civilization of Quran (It is a divine beneficence and came out above our expectation). Our goal was that healthy perspectives on contemporary scientific approaches to existence could be developed and besides Risale-i Nur could be adopted as “an important scientific discovery and source book giving direction to an alternative scientific interpretation that will be accepted” and to lay the ground for it to be presented again in a way that is worthy, contemporary, and academic. One purpose was: To produce serious analyses and studies as groundwork about how to present, to the scientific world and to the humanity, an educational approach that accepts the existence of a creator by contributing to the setting up of the philosophy of science/knowledge of Medresetüzzehra Educational Approach, which is the special name given to an innovative education project presented by Said Nursi at the beginning of the Century, as the teaching of natural and religious science together, in a way where they are reconciled and integrated with our academic activities and training programs, and by making contributions to the production of alternative scientific methods, interpretations and approaches that would gain acceptance. In this journey of discovery that we started with our Risale-I Nur Training Program, we examined the most known theories on and scientific approaches to the existence and the working of the Universe and we made our evaluations, which were at the level of alternative scientific interpretations and we tried to serve this purpose. Thanks to the methodology set forth and analysis and proving methods, , contacts made with contemporary scientific approaches and responses for opponent approaches and above all, authentic definitions, approach methods, conceptualisations and categorical evaluations; superior approaches were utilized like the infrastructure of a philosophy of science and where the changefulness of scientific data will not affect the outcome. The validity of the findings will not be lost, hopefully, until the Day of Judgment, was built with a solid logic construct. Example to other outcomes is the whole of our book ” A Journey of Discovery for an Extraordinary Treasure: Risale-i Nur (The Treatise of Light) Training Program “. 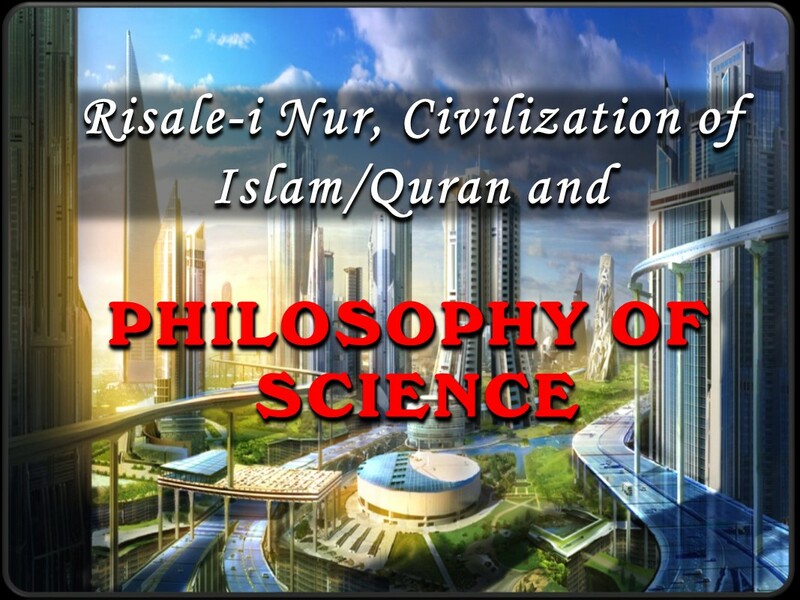 We present our two presentations of Creation Congresses which are very important presentations, and kind of mainstones in building of a Quran civilization and philosophy of science to the attention of the enthusiasts. In first presentation called “The Scientific Compliance of the Thought of the Existence of a Creator and the Laws of Nature “, four significant presentations which are like cornerstones and science manifestos are introduced. “In this study, some inferences are made about the value of scientific approach and studies that investigate the evidence of the acceptance of the existence of a creator for the humanity and makes its inferences in this way and the worth of the scientific knowledge and interpretations in this direction. Also, some analyses have been made about how a scientific approach that accepts the Creator’s existence will be presented to the world of science. The creation model is an upper model that deals with the one who operates the mechanisms and not with the nature of them and it does not address the approaches as evolution directly. “The purpose of study is to clearly reveal out whether it is possible for the material factors in nature to come together and give life to things. Firstly, basic concepts such as “coincidence, material factors, the laws of nature, the mechanisms of evolution”, on which the existence of the material and the formation of an object is based, will be discussed and their features will be analysed. Then, stating that a claim to form the base for the answer to a question like “What is the main reason for the creation of this object or that event?” should first make three issues clear, it will be noted that the validity of the claim could only be checked by analysing the following three issues. 1-The features of the event or object that has come out. 2-Whether the thing pointed out to be the source of the resultant event or object has the features and capacity to create those. 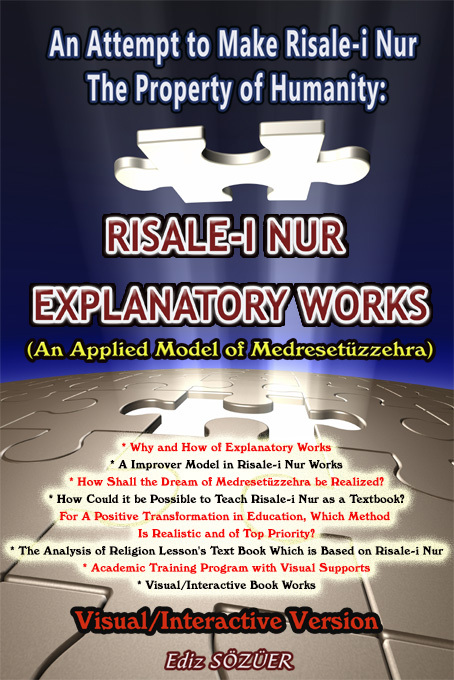 We are inviting you to read this spectacular book where impressive research and analysis are made over “Risale-i Nur Explanatory Works”, which outlines the intellectual framework upon which these explanatory works are based and which is written to introduce you the multi-dimensional services made in this area. Tags: A Journey of Discovery for an Extraordinary Treasure: Risale-i Nur (The Treatise of Light) Training Program, An Attempt to Make Risale-i Nur the Property of Humanity, An imaginary and mental journey of discovery in the depths of divine technology, bediüzzaman said nursi, ediz sözüer, Explanatory Texts for Risale-i Nur (The Treatise of Light), izahlı risale-i nur dersleri, keşif yolculukları, medresetüzzehra, Medresetüzzehra Eğitim Yaklaşımı, risale-i nur, Risale-i Nur (Treatise of Light) Training Program, Risale-i nur dersleri, Risale-i Nur Explanatory Works, risale-i nur eğitim programı, Risale-i nur izah, Risale-i Nur izah metinleri, risale-i nur izahı, risale-i nur sohbetleri, Visual Interactive Book | Permalink.